Today The Candy Perfume Boy and Olfactoria’s Travels have teamed up in a display of perfume synchronicity to review the latest release from Omani luxury house Amouage, an amber named ‘Opus VI’. Birgit of Olfactoria’s Travels is well known for her status as ‘The Queen of Amber’, a title which she has most definitely earned so please do head on over to her blog to read her take on Opus VI. Amouage is a line that I have decided to take my time over. I have sampled almost everything briefly and others in quite a bit of depth. I have even fallen head over heels for two, namely Gold Woman and Honour Woman. The reason I am taking my sweet time with Amouage, a line which I love by the way, is simply because each of their perfumes are so rich and complex they demand a great deal of attention. This is great for me because i get to unravel the mysteries of Amouage over a long period of time, and soak up all of the wonder and magic they have to offer. However, one of the major downsides of this slow-paced Amouage sampling is that I am quite unfamiliar with The Library Collection. The Library Collection currently consists of six opuses, each of which “represents the insatiable quest for knowledge” and “celebrates integrity, uniqueness, and a love of the arts” . Opus VI is the latest addition to the collection and is inspired by Michel Gondry’s Eternal Sunshine of the Spotless Mind, his greatest movie along with The Science of Sleep (I have to say that – I’m in love with Gael García Bernal). Opus VI was created by Dora Arnaud & Pierre Negrin under the creative direction of Christopher Chong and is described as “an amber, leather and woody fragrance inspired by the destruction and reinvention of knowledge and memories. Symbolising the end of a love affair.”  Very deep stuff indeed. I’ve said before that Amber isn’t my favourite fragrance genre, mainly because I haven’t really found an amber that fits me. I think I have come close with L’Artisan Parfumeur’s Ambre Extrême and even closer with Huitiéme Art’s Ambre Céruléen, but still that mind-blowing amber evades me. Amouage’s foray into amber territory however, has really struck a chord with me because it is so much more than just another amber. Opus VI starts spicy and peppery with a strong blast of smoky woods. The intense smokiness in the opening gives it an old-fashioned feel and is evocative of the aged shelves of a library and the dust covered books. Despite this old-fashioned quality Opus VI is a strictly modern perfume and sits comfortably amongst the others within the line. Amouage is well known for the prolific use of silver frankincense in their fragrances and Opus VI is no exception. The frankincense puts this amber firmly into the oriental category, and whilst it may not be an entirely arabian-smelling perfume, after all Amouage perfumes have always been a hybrid of european and eastern perfumery, it is decidedly more redolent of the east than any other fragrance within the Amouage collection. The amber, incense, woods and smoke all rest upon a firm base of gorgeous vanilla. The vanilla is most definitely gourmand and in Opus VI’s latter stages it becomes wonderfully creamy and absolutely edible. This edible quality is what sets Opus VI apart from other ambers, which are usually one step away, but not quite ready to eat. I also can’t help but find the vanilla in the base reminiscent of the sweet smell of old books, I don’t know whether it’s the association with ‘The Library Collection’ that gives me this impression but it’s there and it’s rather lovely indeed. Despite the destructive relationship that is its inspiration, Opus VI doesn’t feel sad or melancholy, instead it has a clarity to it, the sort of clear thinking that only comes when one has accepted the truth of the situation, that in life and love everything that happens, happens for a reason. 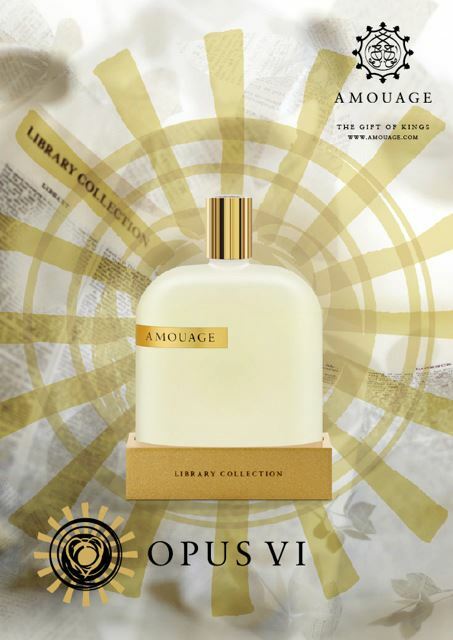 Opus VI is part of Amouage’s Library Collection and is available in 100ml Eau de Parfum for £200. This review is based on a sample of Opus VI provide by Amouage. Posted in Amber, Amouage, Perfume Reviews, Unisex, Woody and tagged 2012 Release, Amber, Amouage, Library Collection, Opus VI, Unisex, Woody. Bookmark the permalink. Oh, I wish I got a little more of the vanilla you describe, on me Opus VI stays quite dry most of the time, I would wish for a little more sweetness. You are most welcome my dear B! Gotta love chemistry and perception! Indeed! I’m amazed that I’m the only one in the gourmand vanilla camp, and also fascinated that the perceptions are so different. Indeed, I am interested to see how this wears on me, as the dryness of my skin causes most volatile ingredients to disappear quickly and sweetness is often what I am left with. I am happier to read this review, though, as I feared the dryness you described, Olfactoria! I love vanilla in Amouages – maybe that’s why I love them so much. (UBARRRR!) I’m really looking forward to how this will play out. Also, I too love the movie. I’ll have to show that to my beloved. Ahh, you’re a fellow Ubar fan! I’d be interested to hear your thoughts when you do try this one. I wonder if you will got more of the vanilla like me? I love that movie so when I read about Opus VI being inspired by it, I got really inspired. I like most Amouage perfumes in the main line, Opus I and Opus III worked the best for me from the Library Collection. So now I’m very curious to try the newest opus. It’s a brilliant movie! Christopher Chong always chooses quite off-the-wall inspirations for the Amouage scents. I’m the opposite to you, I need to try the others in the Library Collection. They sound great. Of all the many millions of things I love about Amouage, it’s that way they take mainstays – amber, in this case – and, well, subvert them, maybe? Whatever they do, they do it differently! You most certainly swooned in your very lovely review! I’m now wondering about this dryness. Seeing as I found the vanilla to be so prominent and with a wonderful, velvety texture. More sniffing is in order! Amouage are most definitely ones for subverting the norm. Christopher Chong has a real nack for directing the creation of some really surprising and unusual fragrances. Like you, I haven’t found my mind-blowing amber yet. So many are just too flat, heavy or masculine for me. I’m very much hoping I get the vanilla you do. Obviously one to try on skin. I love frankincense and amber, have you tried Goutal’s Ambre Fetiche? I too love the film, (though Clementine drove me nuts). Glad the perfume is not as sad though. Love your last para, so true! I shall make sure a bring a sample on the 22nd for you to try. It’ll be interesting to see if a) it’s your mind-blowing amber and b) you get the vanilla that I do. I haven’t tried Ambre Fetiche. Would you recommend it? Clementine was awfully self-centred and annoying wasn’t she. I love Kate Winslet though, she could probably convince me over to the dark side lol. Ha ha! The dark side! Thanks for bringing some Opus VI on the 22nd, I’ll do the same with Ambre Fetiche and we shall see! I love just a straight-up, traditional amber, but this one, smoke and vanilla, has me hooked. I’m going to order a sample, you and BIrgit are such enablers…. We are most definitely enablers, we just can’t help it! I need this purely based on my love for that Gondry film – it is definitely on my top 10 favorite movie list and I cannot watch it without crying. It reminds me of my longest and last relationship. I love the inspiration behind this fragrance and I’m intrigued by the Sechaun pepper notes and also a little hungry now. Hopefully, I can find a sample of this soon. Thank you Alexis. Eternal Sunshine of the Spotless Mind is a film that evokes mixed emotions that’s for sure. Do try Opus VI when you can, it’s my favourite amber so far. I had no idea it was inspired by that movie, which I too love! It’s beautiful, though melancholy; since amber fragrances tend toward sensual, I think this melancholic inspiration explains (for me at least), my experience of VI, which I found completely unexpected— and very interesting. I haven’t made it any further than that though— like the others in the Library Series, it will need some serious wear time before I feel like I have a legible impression of it. That’s the thing about Amouage perfumes, they really need a lot of time to work them out completely. I am not a mad amber fan, but if it is teamed with vanilla that can heighten the appeal of an amber scent no end. I have read both your and B’s reviews now, and reckon I would need that gourmand aspect to come through on me or this would sadly be another amber no-no! I’d be interested to see whether you got more of the vanilla too, I seem to be the only person who is getting it so strongly. 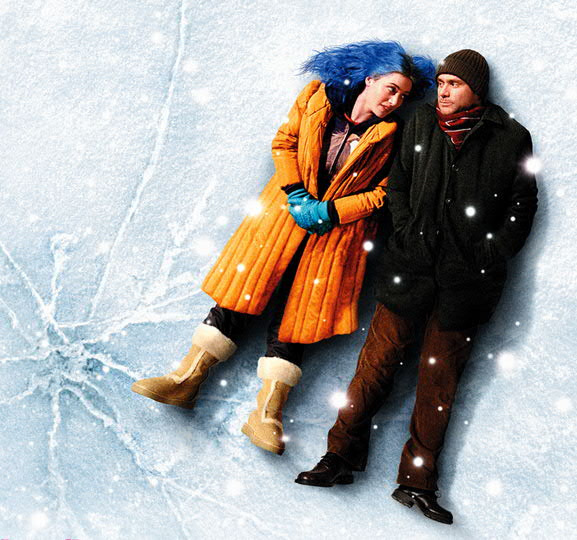 Do see Eternal Sunshine if you can, it’s a bit cooky, but it’s a great film. I didn’t see The Iron Lady, I love Meryl but I’d heard conflicting reports on the quality of the film.